just up the pike: there are great urban spaces in the D.C. area . . .
there are great urban spaces in the D.C. area . . .
We have none, of course. Washington is a city of avenues and streets, coming together in circles that do not function well as public spaces. Our grand ceremonial spaces, such as the Mall, are too large to be great public squares. 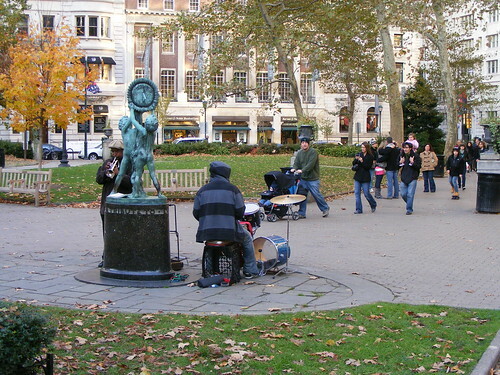 Few if any of our downtown parks demonstrate any of the liveliness of a public square . . .
D.C. may not have its own version of Rittenhouse Square, but we still have great urban spaces. I feel like he's not getting the whole story. There are a number of public squares in D.C. that fail to live up to their potential, like Franklin Park or Farragut Square. But there are many great public spaces that do all of the things Kennicott talks about. Dupont Circle is an obvious example that he seems to brush aside. Sure, a circle doesn't make a great public square, but anyone who knows their shapes can tell you that! 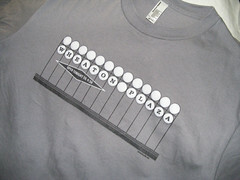 Isn't Dupont Circle "freewheeling?" Don't people meet there, eat there, and piss away the hours there? 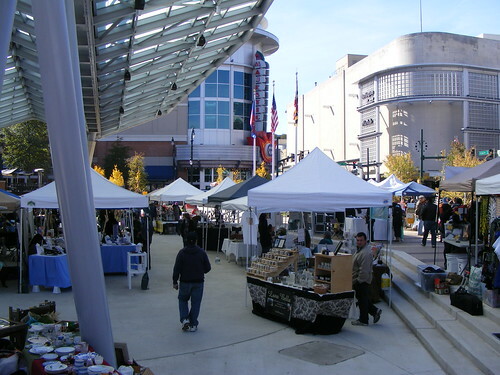 Market stalls in Veterans Plaza in downtown Silver Spring. There are even more places in D.C. that sound exactly like what Kennicott wants, like 7th Street SE outside of Eastern Market or 7th Street NW in Gallery Place. Neither of them are squares, but they're still great public spaces that draw lots of people. The new plaza at 14th Street and Park Road in Columbia Heights has everything he talks about. There's a fountain in the middle for cooling off, tables and chairs for leisurely outdoor dining, and buildings on all four sides that make the space into an "outdoor room." It's a new space, but a promising one. I wouldn't be surprised if it did become one of D.C.'s great urban squares in the future. 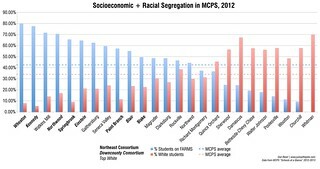 Even more significant, meanwhile, are the public and semi-public spaces that are being created in the suburbs. If you want to see and be seen in Maryland or Virginia, you go to the Market Common in Clarendon, Reston Town Center, Rockville Town Square, Washingtonian Center in Gaithersburg, Veterans Plaza in downtown Silver Spring, or even the fountain outside of Barnes and Noble in downtown Bethesda. These spaces are all fairly new, and most of them are part of planned developments, meaning that people sometimes call them "fake" or "sterile." 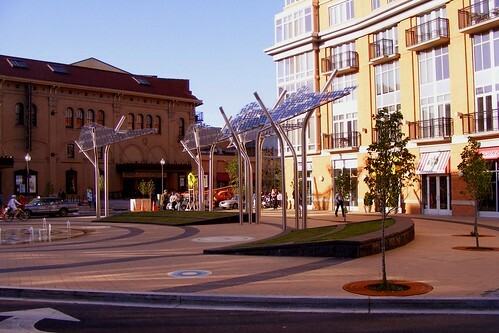 This new plaza in Columbia Heights has the potential to become one of D.C.'s great urban space. Yet these spaces are all well-used, the result of good urban design, a mix of uses, and enough density to fill them with people. They lend the communities they're located in a "sense of place" and help build a local culture by hosting everything from concerts to protests. They may not be in D.C. proper, but they help to create the street life that Kennicott wants to see here. Sometimes, we try to use other places as a measure for D.C.'s greatness. Certainly I do the same while living in Philadelphia, whose Rittenhouse Square is one of the great public spaces in America, if not the world. We don't have a Rittenhouse in the D.C. area, but our region's able to create some spectacular urban places of its own. You just have to know where to look for them.